Crafted in the shape of an old-timey engine, this clock's pendulum swings with each passing moment. Can you hear that? Ah, yes… it's the distant "choo choo" of a freight train. Or in the case of this charming clock, the "tick tock" of time passing. 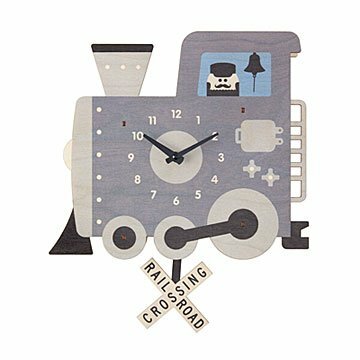 Crafted in the shape of an old-timey engine (complete with mustachio'd engineer), it sports a pendulum in the shape of a railroad crossing sign that swings with each passing moment. It's made from laser cut Baltic birch plywood printed with non-toxic, water-based inks and comes pre-drilled with a hole for quick hanging, too. Made in Massachusetts.